The Stadium Roof Strengthening & Transformation of Queen Elizabeth Olympic Park Stadium is a pinnacle of technical prowess. Even more importantly, it should be appreciated that PHD’s radical methodology dramatically reduced the safety risks, associated with the Stadium Roof Strengthening & Transformation works being carried out 37m above the ground, by obviating the need for 256,000 scaffold components (0.8kg each) – each a potential risk hazard falling from height! The Olympic Stadium was originally designed NOT to have a roof ‘Post-Games’. 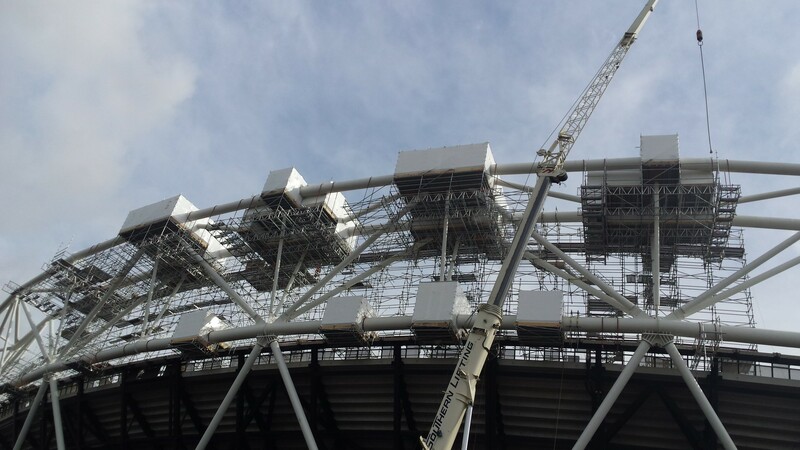 The future use of the Stadium by UK Athletics and West Ham United FC created a major engineering challenge requiring a roof to cover the retractable seats with loadings for the roof compression trusses rising from 1,400T to 4,000T + no scaffolding to touch any part of the trusses + very limited permissible leg loadings onto the Terraces. 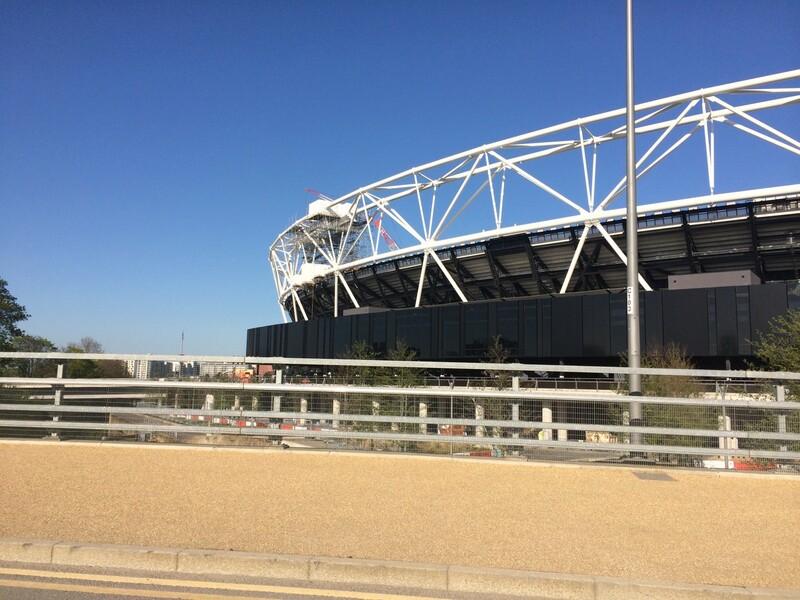 There was a strict deadline of 25 weeks for completion prior to the Rugby World Cup 2015. 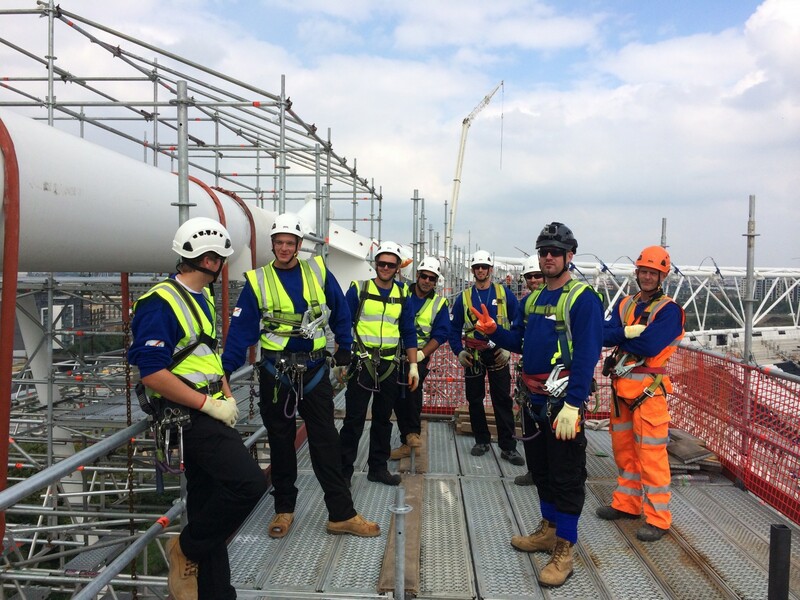 The limiting factors meant that the traditional ‘bottom-up’ tube & fitting approach, requiring between 200- 300 scaffolders working 24/7 to be achievable. This was not a viable option. PHD produced a bespoke, radical ‘top-down’ innovative solution born out of the methods reserved for offshore Oil Refineries, using suspended scaffold via chains with lockable grab-hooks with clutches to shorten and level the suspended scaffold creating ‘workshops in the sky’ – 37m high! Such was the volume of the challenge PHD took the whole stock of clutches from England, Ireland and Austria! 480t of Layher lightweight system scaffold was suspended in Phase 1 to create the pods enabling access to 50% of the high-level roof trusses for the welders. This was then all taken down and re-assembled to enable access to complete the Phase 2 50% of the stadium roof strengthening works. Metal decks, fire rated plywood, wrapping and zipped doorways were used to create the 56 No high-level ‘Workshops in the Sky’, plus 112 No low-level work platforms, creating a safe and secure working environment for the welders and metal workers who carried out the strengthening of the roof trusses. The biggest limiting factor was ‘windage’* for the 2 No 120t crawler cranes and the key to the success to this project was positive collaboration between all the parties. * Windage is a force created on an object by friction when there is relative movement between air and the object. There are two causes of windage: The object is moving and being slowed by resistance from the air. A wind is blowing producing a force on the object.